As soon as we met Jerry Nelson at the South Dakota Festival of Books, we knew he was the real deal. He has that subtle, dry, Midwestern wit that sneaks up behind you and then whacks you right in the funny bone. 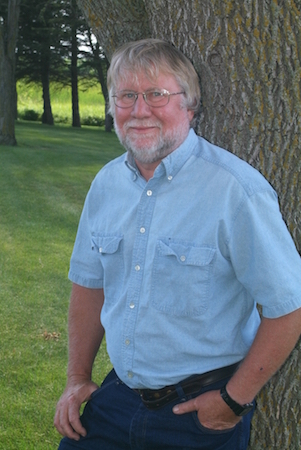 His first book, Dear County Agent Guy, will be published on May 3rd. Publishing is a long row to hoe, so Jerry shared his story of how he did it. This column first appeared on Agriculture.com. It’s been nearly two decades since I began to do this silly writing thing. During that time, folks have often asked if I had considered publishing a collection of my selected works. This concept had a certain appeal – Fame? Fortune? Exciting new income tax deductions? – so I investigated the matter. I soon learned that landing a book deal with a mainstream publisher – a publisher who isn’t just some guy with a Xerox machine in the trunk of his car – is only slightly less difficult than climbing Mount Everest on roller skates. So my wife and I began to look into self-publishing. Some very famous writers have gotten their start via self-publishing. The original author of the Ten Commandments is a good example. While it’s unlikely that you’ll receive a rejection letter from your self-publisher, self-publishing also has innumerable pitfalls. The main one is the actual publishing process. I envisioned my wife ensconced in the basement, furiously cranking out copies of my work on a mimeograph machine. Meanwhile, upstairs, I would be slaving over a hot keyboard. It was a daunting proposition, but might be doable so long as my wife’s cranking arm held up. One September day we decided to attend the Festival of Books, a shindig that’s put on each autumn by the South Dakota Humanities Council. Call us wild and crazy, but our idea of a good time is browsing through stacks of books. The Festival featured something called Pitchapalooza, an event that was conducted by the husband and wife team of Arielle Eckstut and David Henry Sterry. Pitchapalooza participants must first buy a copy of Arielle and David’s book, The Essential Guide To Getting Your Book Published. Aspiring authors are then given 60 seconds to explain to the room why their book should be published. Beginning… now! Even though I estimated my odds at somewhere between “none” and “lower than the bottom of a badger hole” I thought it was worth a shot. I stood up in front of the assembled and dissembled about my columns and the idea of publishing a collection. Arielle and David offered upbeat and constructive advice, but added that nobody publishes collections anymore. Even so, they were kind enough to give me the contact info of a literary agent named Danielle Svetcov. Danielle cautioned that nobody publishes collections anymore, but nonetheless thought that I should whip up a book proposal. Relying heavily on advice from Danielle and from Arielle and David’s book, I hammered a proposal together. When I printed it out, it was as thick as an oak tree. Danielle suggested that I email my proposal to a handful of book editors. I didn’t expect to hear anything back from any of them. This is often how it goes in farming: no matter how hard you work, at the end of the day your wife will still probably tell you to get your muddy boots off her clean kitchen floor. I felt like a man who had been stumbling around in a barren wasteland when one day, without warning, he spies a unicorn. Things like this never happen. At least not to me. But there it was in black and white: A contract. A book tour. An advance! Did I mention that I now have a publicist? Everyone should have a publicist to handle all the tough questions that life throws at you. I quickly discovered that having a publicist won’t get you out of household chores. It was worth a shot. So here I am at the same old desk I have used for nearly 20 years. In my sweaty paw is a copy of a sparkling new book titled Dear County Agent Guy, which, I have been told, will soon be available in bookstores everywhere. All because of this silly writing thing. 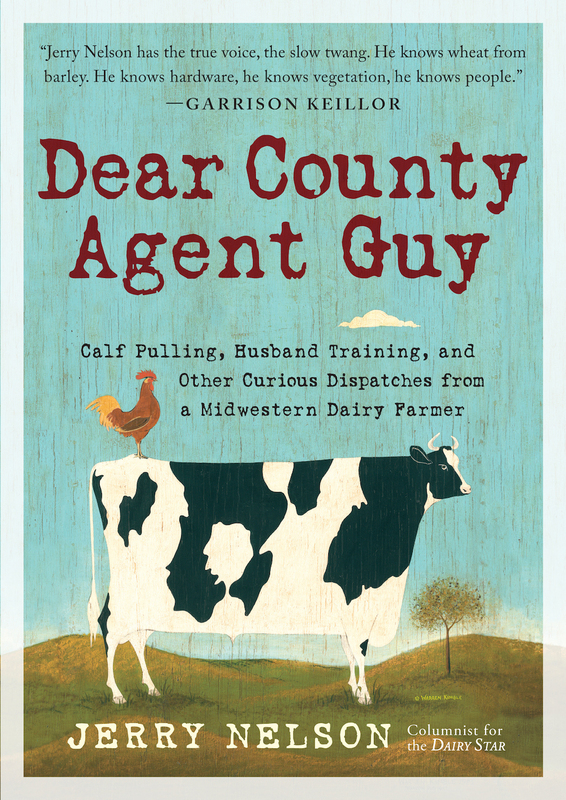 Dear County Agent Guy will be available from Workman on May 3, 2016. Look for our interview with Jerry in the Huffington Post next week.